Sunday, 20 July 2014, was a significant day in the life of the Millisle Church and also in the lives of Chris and Nicola Clarke, as Chris was inducted as Assistant Pastor. During his second year of study at IBC, Chris had spent his student placement in Millisle - from October 2012 until April 2013. Very quickly, he and Nicola integrated into the life of the fellowship and throughout the next six months, it was a joy to see what Chris had been learning being applied and to mark the development and deepening of his preaching and ministry. Following their departure, we continued to mark their progress with much interest and prayer and, on 20November, a call was issued to Chris to serve as Assistant Pastor, for a period of two years. After careful and prayerful consideration by Chris and Nicola, the call was duly accepted. A large congregation of family, friends and members of Bethany Baptist Church, Bangor (Chris and Nicola’s home church) gathered for a blessed afternoon. The service was led by Pastor Andrew Roycroft, who also performed the Act of Induction and ministered God’s Word. Others participating included Stephen Logan (Elder and Secretary), who gave a history of the call, Pastor Peter Firth (IBC), who led in prayer, Pastor Steven Curry, who brought greetings from Bethany Baptist Church and Pastor James Byers (Nicola’s Grandfather), who concluded the service in prayer. 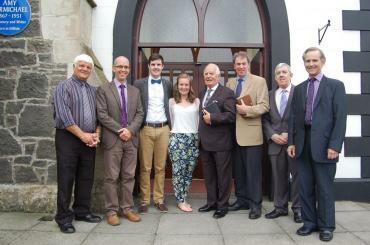 Our prayer is that Chris and Nicola will be richly blessed as they serve and minister to us here in Millisle. We, also, want to be a blessing to them as we give them encouragement and support, share in fellowship and mark further developments in the work of God. This report was written by Stephen Logan (Millisle Church) and published in the abcinsight magazine (Oct/Nov 2014 edition).